6 Things to do Before Painting a Room. Interior painting prep for a professional result. Summer is coming to a quick end. The first part of summer slowly passed but this last half has flown by in front of my eyes. Over the past few weeks I painted two rooms in my home and I have a long list of painting projects left. However, I have decided to save the rest of the projects for when my oldest boys go back to school. Trying to paint and corral all four kids was a long process. I have come to realize that a lot of people are intimidated or don’t know where to start when it comes to painting rooms in their home. I am such a believer in making a house a home. A home should be a place where you find peace, comfort and a sense of calm. Maybe my need to feel at home comes from the fact that my zodiac sign is a cancer. It is said that cancers have to have a home to call their own because it makes them feel safe and secure. They will go out of their way to decorate and furnish their homes and tend to be home bodies. Both hands in waving in the air because that is totally me! 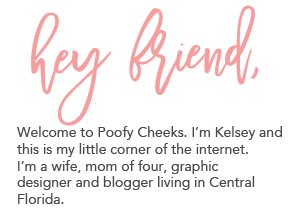 *This post contains some affiliate links to products I really use when painting in my home. 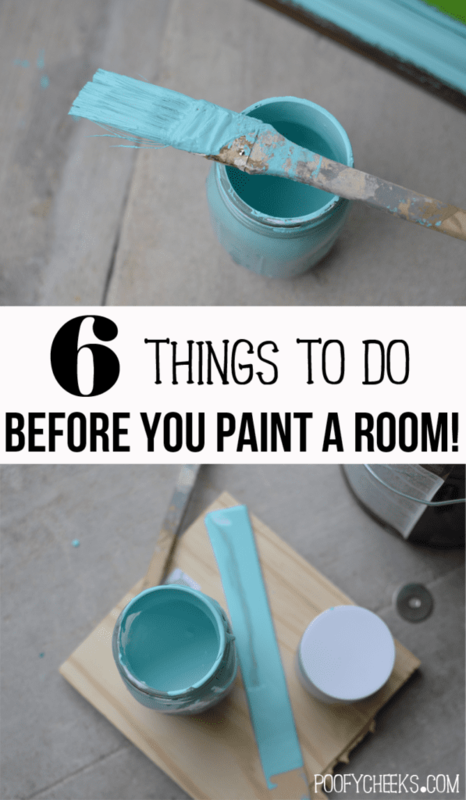 Let’s get to it – the six things to do BEFORE you paint a room! Most people try to skip these steps because they aren’t very fun. Even I want to skip some of these steps and get straight to the painting… so I can see the results. The truth is that without these steps your paint job is going to look sloppy. News flash – I want my rooms to look like they were done by a professional not a child. Take down everything hanging on the walls and remove all screws and nails. I mean EVERYTHING! Move all furniture out of the room or into the middle away from the walls. If you are leaving furniture in the room you may want to cover it with old sheets, plastic or a drop cloth. Patch all nail holes and small imperfections with nail hole filler. I recently was introduced to this Dap Patch Stick Nail Hole and Crack Filler and the lid doubles as a spackling knife. Mind = Blown thanks to this convenient little product. When I painted our master bedroom last week I used it to fill all of the screw holes and a divot in the wall from before we moved in. After the spackle has dried use a handheld Sanding Sponge to smooth out the spots where you applied the nail hole filler. The filler says ‘no sanding required’ but I like to be on the safe side when I’m working on a smooth wall. If your wall is textured then you could probably skip this step. Remove all light switch plates, outlet covers and any vents in the room. Another tool I was recently introduced to was the Husky 14-in-1 tool which I used to open my paint can, remove nails in the wall and unscrew the light switch plates and outlet covers. **This is not an affiliate link – just a truly awesome product. Please be VERY careful when working around electrical outlets and make sure kids are not around. Besides for removing everything from the walls this is easily the most important step. Clean all dust, dirt and grime from the walls, ceilings and baseboards. Until you are up close and personal with your walls you may not realize the dust that is collecting on them. If you were to paint over the dust it would get caught in your brush and spread across the walls making a smooth wall not so smooth. Dust on the ceilings and baseboards makes for uneven lines while you’re trimming out a room. I told you these steps weren’t very fun but once they are done all that is left to do is to paint. I’ll be sharing my detailed steps for painting a room soon but basically I trim out the room by painting around all of the trim and where the wall meets the ceiling. Then I get my roller and fill the rest in. Great! I am getting my house Painting In Fort Worth this month. Thanks for the tips. Keep exploring. Great tips! Thanks for sharing about that stick. I'll need to get us one of those.